Daniel Jamous’ first film, “Pearls of Irregular Shape,” should be an inspiration and a model for local cultural councils everywhere for the way it gracefully shows the enriching effect of the arts in community life. 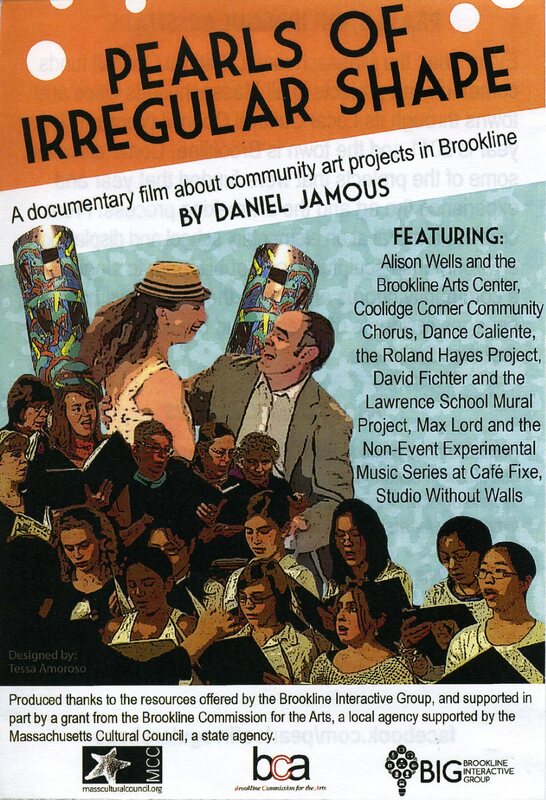 This 55-minute documentary follows seven projects funded in 2011 by the Massachusetts Cultural Council in the town of Brookline where Jamous resides. He alternates between the seven during the hour, often showing the progress of the project throughout the year. Collaboration and inclusiveness are the key elements. A new mural and garden for the Lawrence School involves the participation of all the students. The Coolidge Corner Community Chorus has a welcoming “no audition” policy. Dance Caliente brings social dancing (and a bit of its history) to a senior center while the Roland Hayes Project takes a similar tack, taking its young adult singers beyond music education by involving them in the story of Hayes, the barrier-breaking African-American lyric tenor who came to live and perform in the Boston area. Other projects include oil painting, electronic music and outdoor environmental sculpture. At a time when operating budgets are stressed at every level of government, a work like “Pearls of Irregular Shape” stands as a great example of how diverse arts funding can have a positive and lasting role in civic life.